See our smiling faces! That's my daughter-in-law, Kristen, with me at Christ Church Cathedral in St. Louis, waiting for Ree, AKA The Pioneer Woman. Her book signing tour stop in St. Louis, sponsored by Left Bank Books, was moved to accommodate the large audience. SRO -- which I had to explain to someone who wasn't sure what I meant. Huh? SRO means the 500-seat cathedral was packed. I saw Kristen! No kidding! Of the hundreds of people getting off day shift and pulling onto the crowded lanes of I-255, at the exact instant I was nearing the end of my two-hour drive, Kristen merged right in front of me! Insert Twilight Zone music here. Strange goings-on in my normally dull little world. First, the kooky incident with the shortbread earlier in the week, and now this! So anyway, I dialed up Kristen on my cell (without taking my eyes off the road, or my hands off the wheel, of course) and before I could say I was behind her, she said she could see me in her rear view mirror. Then she obligingly slowed down to a cautious-mother-in-law-just-in-from-the-prairie speed and I followed her home. After a quick change, we headed downtown and arrived early enough to get a good seat. We bought all the books we could carry in two shopping bags and then made a few friends while we waited. At one point in our wait, the church pastor stepped up to the mike, welcomed guests and invited everyone to explore the historic cathedral building, with the self-guided tour brochure provided, during our wait. It is a beautiful old cathedral. I thought the book signing was well organized and the Left Bank Books people (and Ree, of course!) were very accommodating. LBB had plenty of books available for us, transactions were handled efficiently, and Ree, after answering questions from the audience, sat there for hours and hours, cheerfully signing each and every book handed to her! I've never been to a book signing with an author who was so kind and patient! While we waited, Kristen and I decided to help all we could by writing the name for each inscription on the bookmark LBB had placed inside, and then we inserted the bookmark and tucked the jacket flap to mark the page to be signed. After we got in line, the LBB workers helped others do the same thing and I know that speeded up the process tremendously. That, and the fact that Ree can talk and sign simultaneously! Our new friends, who sat in the pew next to us, were Dee Ann and her daughter, Sadie, along with their friend, Katie, all from Mount Vernon, IL -- which is also a two-hour drive from St. Louis (but only a one hour drive from my home!) Small world! Half of our pew and several others were from the Illinois side of the river! You do know which river I'm talking about don't you? I hope so, 'cause if I had a smartypants quiz, that would be on it! Back to the book tour. Ree came out and talked a few minutes and then took questions from the assembled book lovers . . . oh, let's just call 'em as we see 'em . . . Pioneer Woman fans! She even did a bit of Ethel Merman for us. Kristen didn't know who Ethel Merman was, but was amused nonetheless. In the meantime, Marlboro Man stepped out into the audience to snap a few pictures, just as two little boys made their way to the pulpit to get a better angle on Mom/PW and Dad/MM. Let's just say, the whole family knows how to work the room! And Punk Son#1 charmed the crowd a little later, too, as they waited in the long line for Ree to sign their books. He signed cookbooks -- and the hand of one very cute little girl! Sorry, no picture. 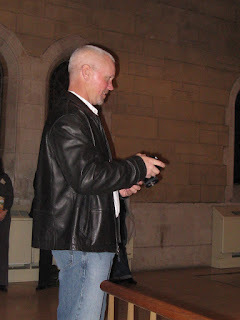 I still haven't mastered rapid-fire photo ops in dimly lit stone cathedrals. It was so good to see Ree after all this time. Well, maybe not so long. We were just in Chicago in July for BlogHer '09. And then we were in San Francisco in September for BlogHer Food '09. We food bloggers are very busy people, I guess. OK, some a little busier than others, I'll admit. While I'm checking out the new Schnuck's in Des Peres tomorrow (they have wine to drink while you shop, and it's all in the interest of food blogger research, you know!) and then heading home tomorrow, Ree will be in Chicago on Thursday . . . and Minneapolis on Saturday . . . and Los Angeles on Sunday . . .
And then I'll be home, in my kitchen at Prairie Wood, trying to get a handle on Thanksgiving dinner, not to mention find enough tables, for 32 30* people. Two fried turkeys and one ham . . . or two hams? Hey, back up a minute. Does that make me, Cora The Prairie Woman Cooks? Back to the blog drawing board. Funny story! I had a lot of fun there last night. Do you have a favorite recipe of hers? Sounds like you ladies had a great time! Hope your trip to the new Des Pres Schnucks was everything you had dreamt! It was a great evening, wasn't it! Ree was even better in person! I'm "trolling" the internet for all the other PW fans and blogger who were in StL Tuesday night. It is so much fun to see everyone's photos and read their impressions of PW, the Punks and MM...or is that YUMMMMM. I'm not a photographer or cook, I just enjoy reading about the day to day life on a ranch. And Ree does such a tremendous job of telling her story. I see a little bit of my 6' 5" sons head in your picture! He attends law school in St. Louis and made his mom a happy gal by buying a cookbook and getting it signed for me!